My name is Pearl, and I’m a cheater. Thankfully, not in the Josh Duggar Ashley Madison way, but a cheater nonetheless. I have been having the hardest time sticking to my diet lately. If I’m not eating noodles and rice with the rest of the family, I’m eating cereal and cake and cookies. Just stuffing carby food in, without really enjoying it. I figured, if I’m going to cheat, I may as well make something worth it that I’ll really enjoy. Probably not the healthiest way to approach food, but I’m good with it! 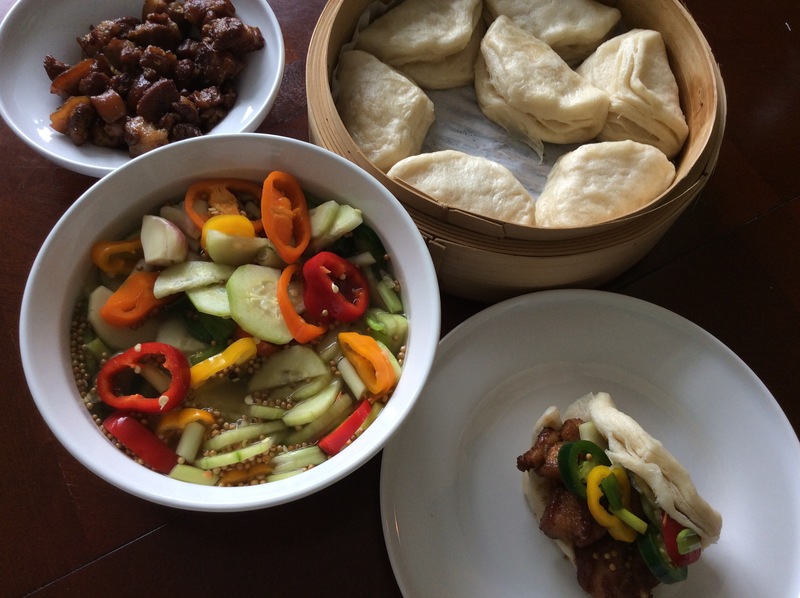 Time for my cheating Chinese buns filled with braised pork and quick pickled vegetables. Yum! 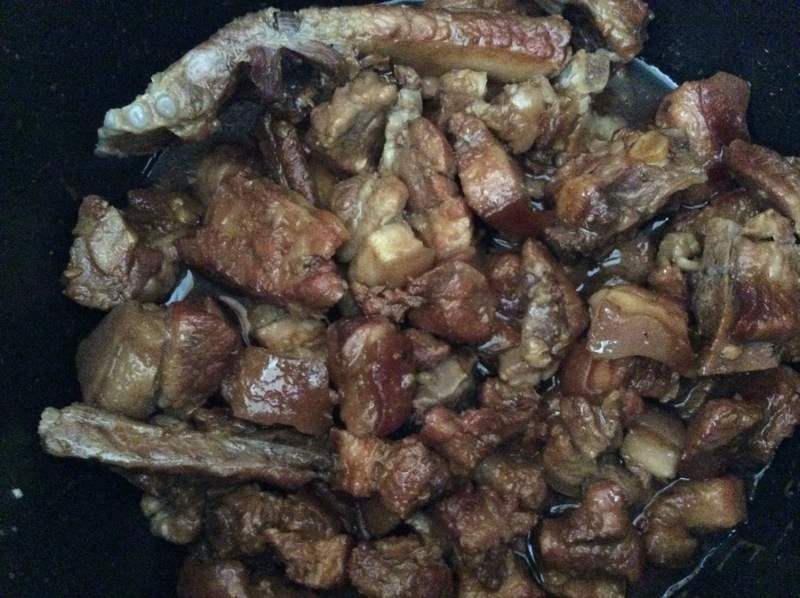 I cut the pork into 1 inch cubes and threw it into my electric pressure cooker. 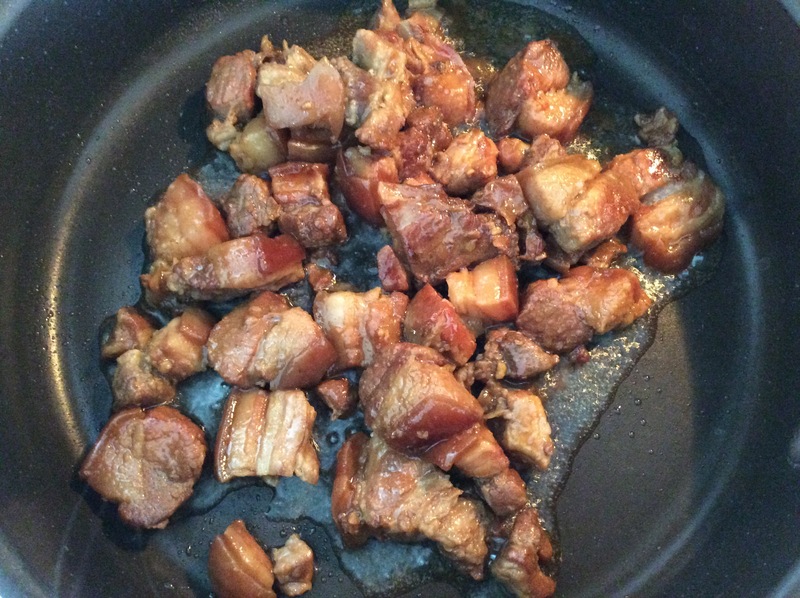 If you don’t have one yet, just use your stovetop on medium-high heat and turn it down to low once the pork is browned. Make sure to keep it covered. 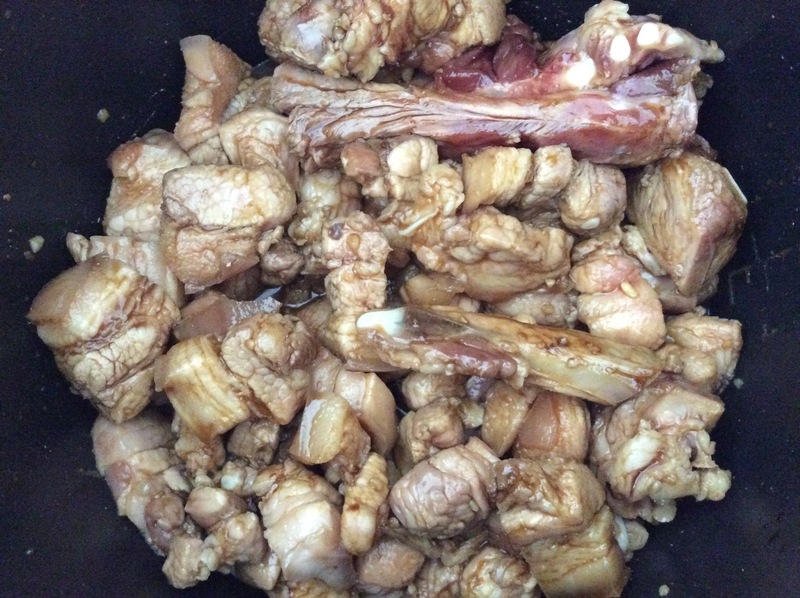 I just put in a bit of coconut oil to help with the browning before the fat rendered from the meat. Typically, I use pork belly for this dish, but it wasn’t on sale this week. I actually prefer this cut, it’s fatty, but not so much that the kids get grossed out. They haven’t got the palette for super fatty meats yet. You could use any type of meat for this dish, duck, chicken, beef pork. Just adjust the cooking process for what you have. Roasted duck is delicious, and chicken could be quickly stir fried with the same ingredients with similar results. 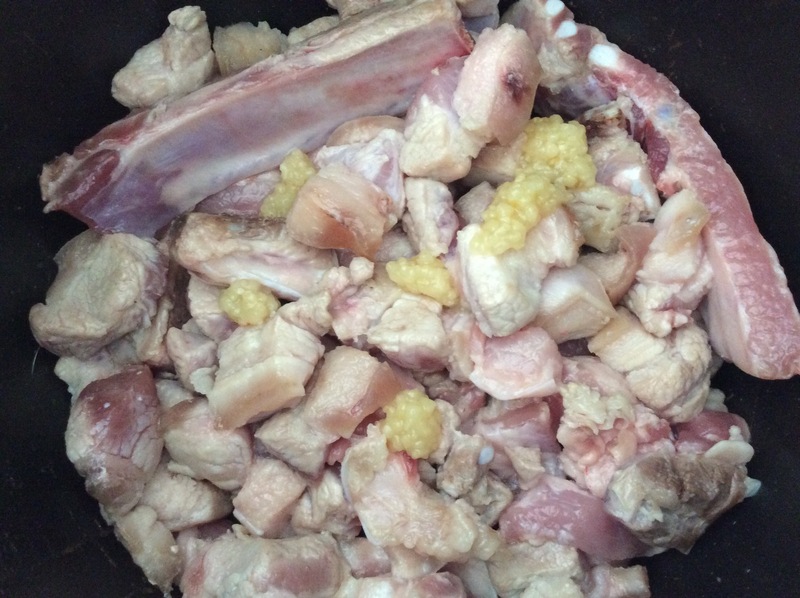 Once the pork started browning, I added some minced garlic. It helps get rid of the porky smell that can sometimes be a little strong. Then I poured in some cooking wine, sweet soy sauce, and the seasoning sauce. Regular or low sodium soy sauce could be used in place of the seasoning sauce. After the pork is done, it’s unbelievably tender and delicious. You could use it just like that, but I like to add one more step to the process. 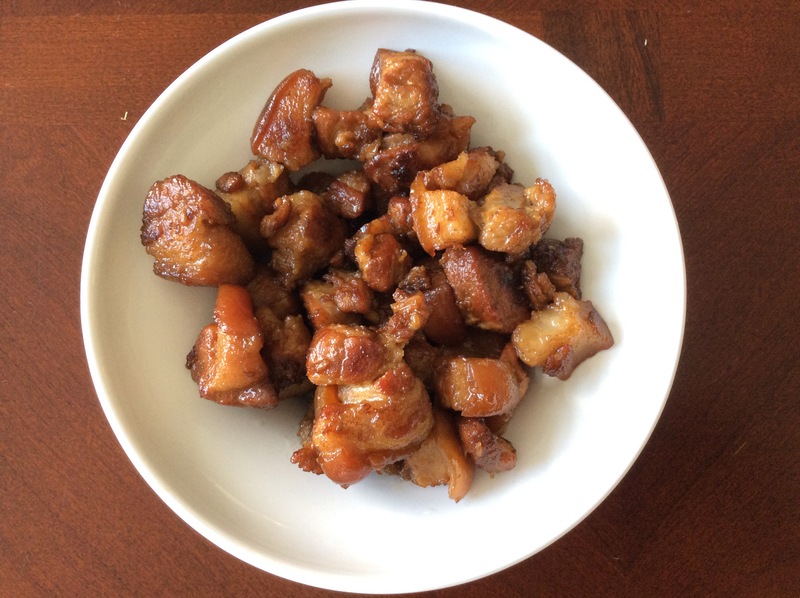 I cook it over medium heat in a non stick pan to render out a little more fat, and add some caramelization to it. While the pork cooked in the pressure cooker, I prepped my veggies and made a quick pickle for my sandwich. That’s one of the main reasons I love my pressure cooker. It enables me to get one component started, while freeing my hands up to work on other things without worry of burning or stirring. The rich fatty meat really needs some acid to cut through it to brighten the taste. It’s awesome the way it is, but together, the dish is elevated to another level. 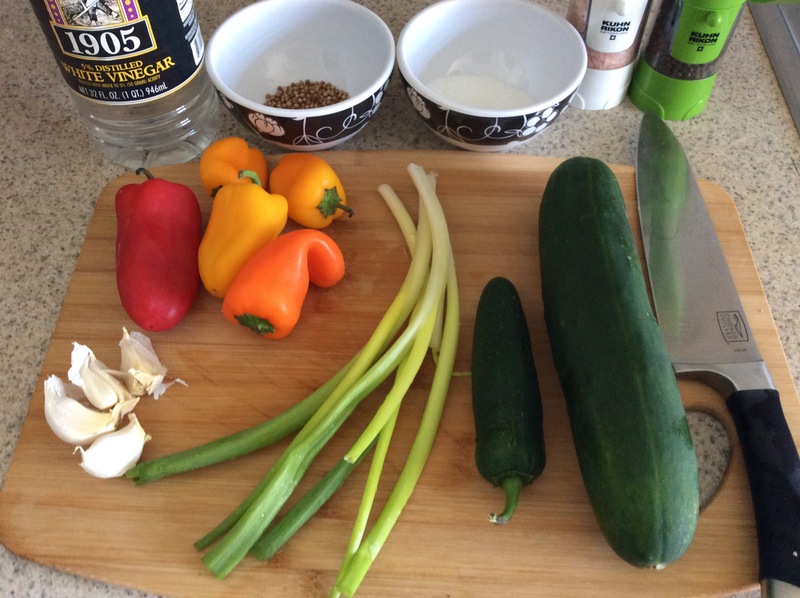 The pickle ingredients were very simple. Vinegar, water, coriander seed, sugar, salt and pepper were mixed together, and everything was peeled and chopped and added to the pool. The vegetables just hang out while everything else cooks. 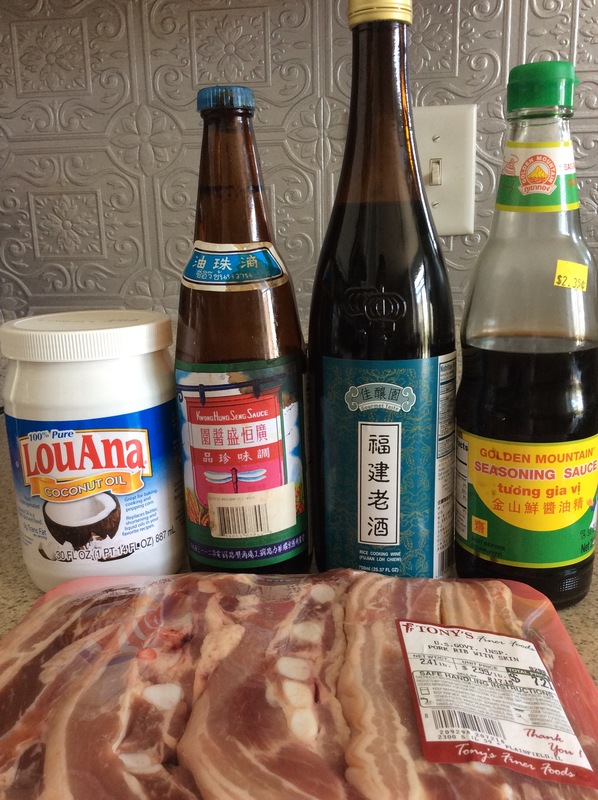 My big cheaty secret to this dish is what I use to make the bao, the bread component. I don’t mix flour, or knead dough. I have never tried and never had to. I just break open a can of biscuit dough and steam them. It’s cheating, I know, but I can’t argue with the results. 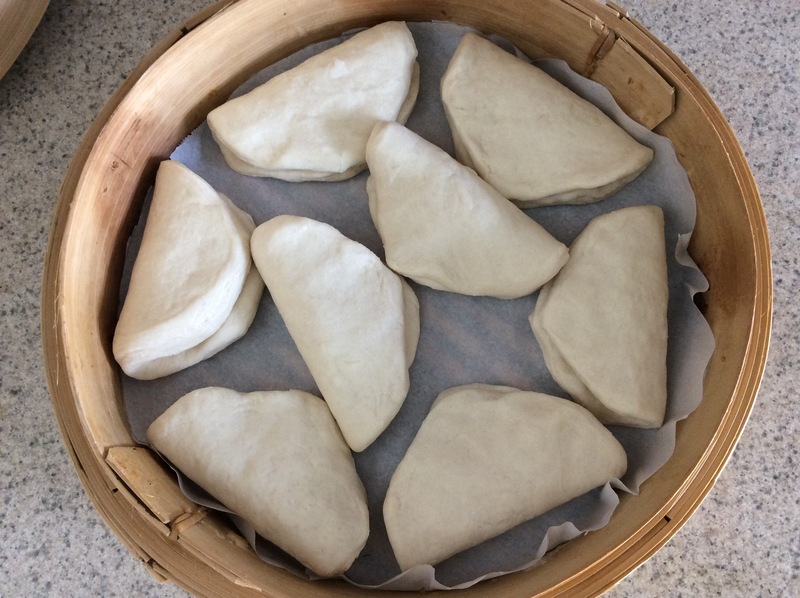 Perfect bao in no time! I flatten each biscuit with my hands and fold them over. 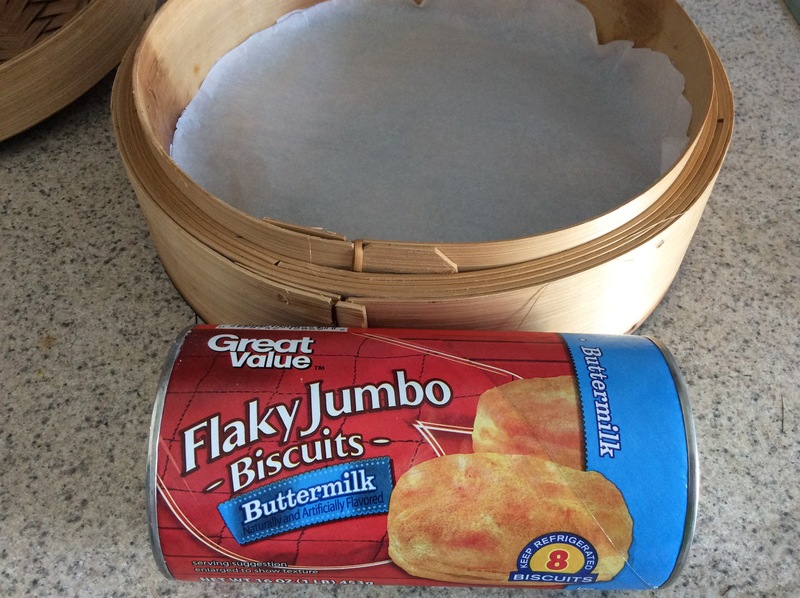 My steamer can hold eight large biscuits, one whole can. I take that as a sign that it’s meant to be. Just be sure to line the steamer with parchment paper to prevent sticking. Also, make sure there is enough water in your pot to steam. 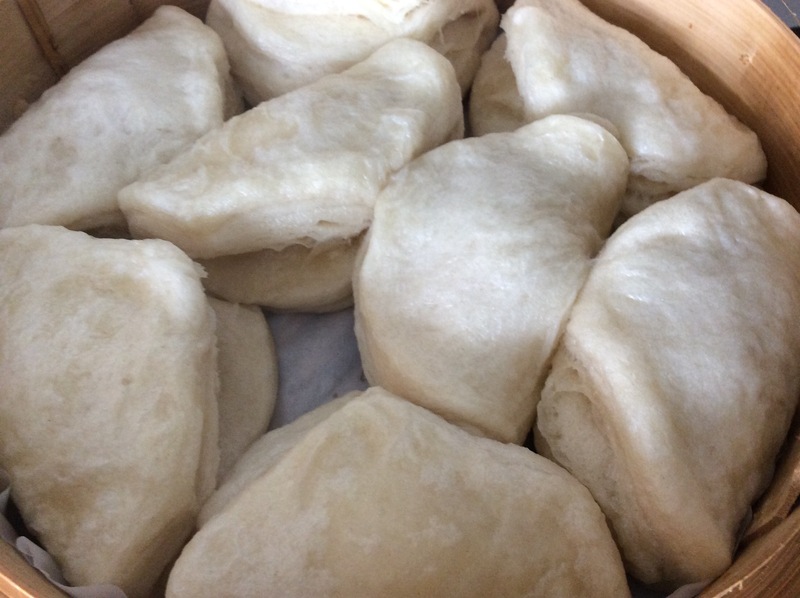 I ran out once, and wound up scorching my steamer and ruining one batch of bao biscuits. Let me tell you, the smell of burning bamboo is not appetizing. Trust me. The buns only take about 8 minutes to steam. They’re soft and pillowy, my girls love to eat them just as they are, without any fillings. They are really good, and such an easy substitution, is it any wonder that I use them to cheat? All that’s left to do is assemble and enjoy. I put a smear of hoisin sauce on the open bun, fill with meat and pickled veggies, fold over, and nom nom nom!